RISE is a device that could help the medical practitioner to locate the proper vein more easily for needle injection. Hypodermic needles are widely use under different kinds of medical circumstances, such as blood draw, injection, vein injection, etc. Issues releated with needle usage are being explore in the first phase of this project. Needlestick injury and difficulty of locating the vein are two major problem that arise during research. While using needles for injection, blood draw and IVs, some patients are harder to locate the vein and need to take multiple sticks before the needle get into the proper vein. The reasons could be different, some have small veins, some have their veins buried deeper and some are caused by being dehydrated. In order to help the patients from suffering multiple sticks, it is important to locate the vein more and increase the rate of first-stick success. The first stage of ideation focus on all kinds of possibilities of how the device is being hold by user and how does the device shows the veins. Different ideas include a watch like shape with small screen on it, a magnifying glass like shape with thicker handle, a ring like device that users could put on their fingers. The conclusion for this stage of ideation is the form that user could hold in their hand with the size similar as an egg. For the first stage of prototyping, the mockups are made of papers, foam boards, 3D printing and simple circuits. The sketching concepts are brought into real function mockups and being tested. LED Color : White and Red have the best effect on showing the veins. Blue, Green LED have difficulties to penetrate the skin. LED Arrangement : All three kinds of arrangement including circular, oval and parallel have shown the veins clearly. Consider about the space taken and performance, the parallel arrangement seems to be better. Wearable : The veins are clear to see, however, it's hard for the user to keep a consistence distance between two fingers which made it hard to move around the arm while finding the veins. The sketches shown the exploration of different forms that are based on same holding posture. 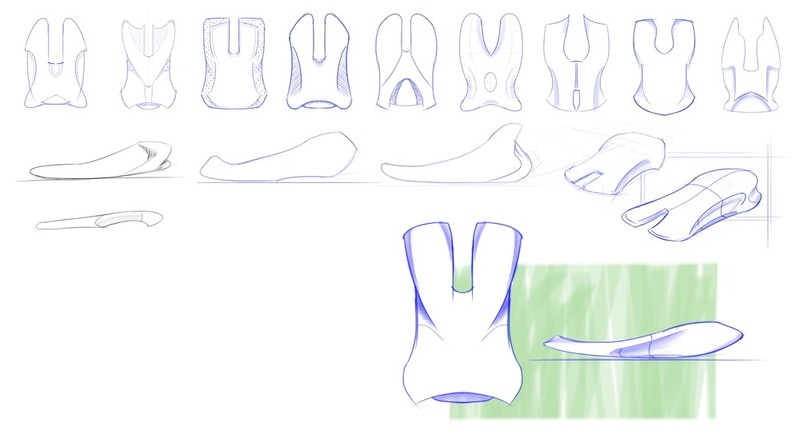 In the second stage of form exploration, the foam models are developed base on the handheld device concept which user could easily operate with only one hand. 3D printed prototypes are built with circuits and test with function. The final prototype would be using ultra-brighter white LED arrange in the parallel position. The form would be more ergonomic and fit different holding gesture. There are three different ways of holding this device. One would be holding it with thumb and index finger on each side, another is to hold with two fingers pressing it from the top. The last way is using the thumb to press from the top while doing the needle injection.